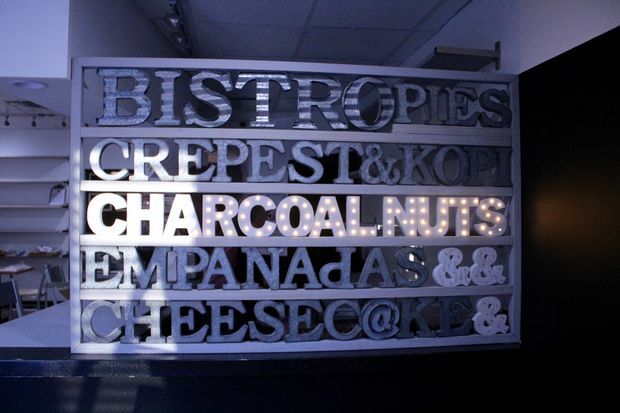 A light-up sign inside Bistro 6050, whose menu includes sweet and savory bites from around the globe. PORTAGE PARK — The wait is over. After a marathon design and renovation process, Bistro 6050, 6050 W. Irving Park Road, opened to little fanfare on Feb. 1, its owners announced Monday. The self-described "snack bar" offers a smorgasbord of homemade desserts and savory bites spanning a wide cultural spectrum, from bubble tea to empanadas to Belgian chocolate mousse. The menu concept is "street food inspired from all over the world," according to Chris Touwaide, who co-owns the space with his wife, Roselle. "People can get off the highway and stop over quickly for a snack," Touwaide said. "Or they can stay and have something to nibble on, and use our free WiFi." The Touwaides have owned the building for at least two years, according to Joe Basilone, co-director of the Irving-Austin Business District. "They've spent a ton of time building out what looks like a really beautiful space, and everything I've tried of theirs is just delicious," Basilone said. "There isn't exactly an abundance of high-quality food choices in our area, so I think they'll be a great addition to the neighborhood." 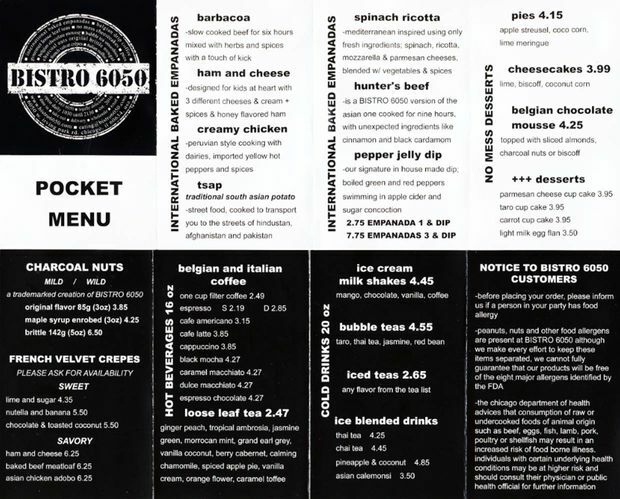 Bistro 6050 is open every day from 10:30 a.m. to 9:30 p.m.